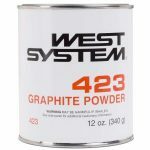 West System 423 Graphite Powder - Goosebay Sawmill and Lumber, Inc.
423 Graphite Powder is a fine black powder that can be mixed with epoxy to produce a low-friction exterior coating with increased scuff resistance and durability. Epoxy/graphite is commonly used as a low-load, low-speed bearing surface, as a coating on rudders and centerboards, or on the bottoms of racing craft that are dry sailed. It does not provide anti-fouling qualities. The epoxy/graphite mixture cures to a black color. Add to mixed resin/hardener at the rate of 10% by volume or 1.5 tablespoons per 8 fl oz. of epoxy. The 12 oz can of 423 will modify approximately one gallon of epoxy.